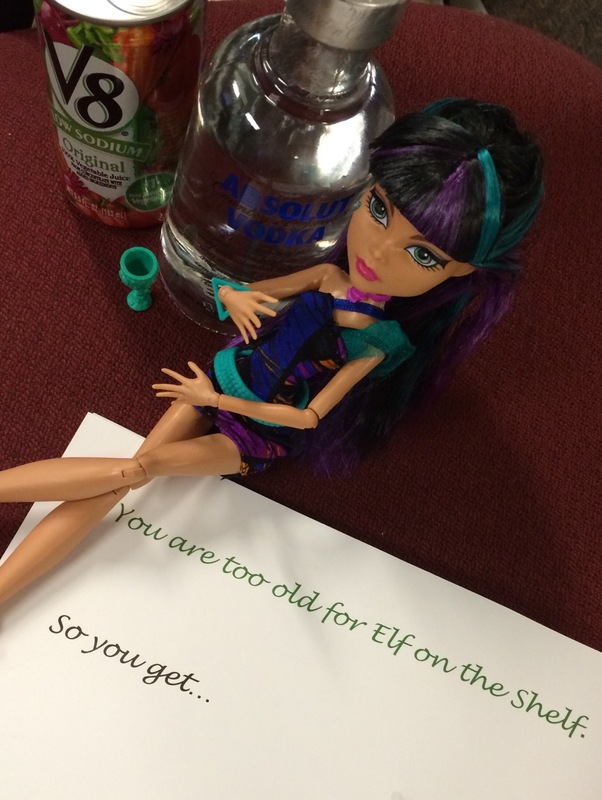 The Whore in the Drawer spoof of Elf on the Shelf has been even more amusing than I thought. I knew it would be funny but it has been a slapstick comedy from start to finish. First of all Sue busted me hiding Cleo (for that is her real name) in her office. In my defense she is almost never in at 8am! Then we got to hear all these funny stories of people walking past Sue’s desk and wondering what on earth was sitting in her guest chair! Our little joke was a popular attraction. Thankfully she had all the fixings for a Bloody Mary so she could properly entertain. Now Sue has passed the bottle and managed something I didn’t think was possible. Turns out you can make her pole dance. I burst out laughing as soon as I saw the photo. 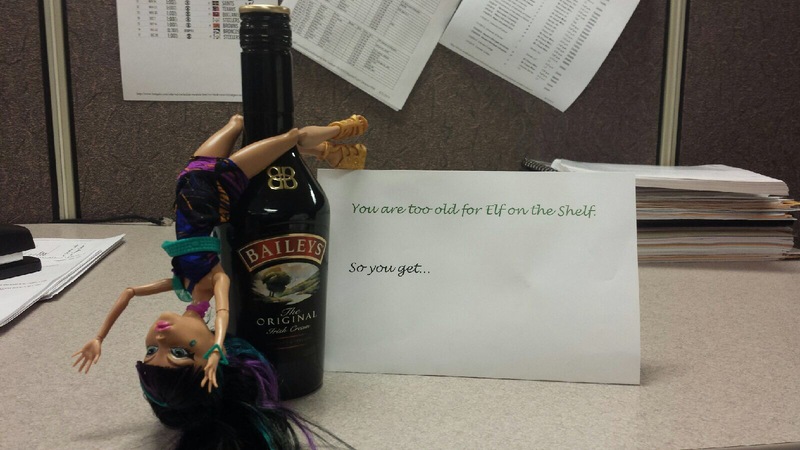 And it turns out getting busted is a theme cause a coworker caught Sue hiding her this time! So while this may not be the most office appropriate holiday tradition, it has been a good one. We get to laugh when we hide her, we laugh when we find her, and we laugh when we see everyone else’s reaction. Really the point of it was just to have a little fun and keep us sane, so mission accomplished you little Ho in the Company Dro. I can’t wait for it to be my turn, and am devilishly curious as to where I will find her! May you find lots of love, humor, and and joy in the little thing this holiday season. For all those little things add up, and really they are what make life good from day to day.